The title is obviously a recall from the movie “Evita”, starring Madonna and Antonio Banderas. In fact Buenos Aires (the complete name is Autonomous City of Buenos Aires) is the capital of Argentina and it is a place which is loved by tourists because some many reasons, especially because it well known for being the so-called the South-American Paris. Not only it is the largest city of the country, but it is also the second largest metropolis area in South-America, following Saõ Paulo and one of the 20 biggest cities in the world. First, of course, it’s one of the best places where you can learn Spanish, while enjoying the porteño (literally “of the port”) life, since Buenos Aires has the best quality of life in the entire Latin America. Second, you can learn how to dance tango (remember one of the city’s nickname’s “the capital of tango”) or, if you prefer, you can enjoy the very late shows at some night-club along the streets. If you love going to the opera and stuff like that, keep in mind that Buenos Aires has the busiest live theater industry in Latin America, and it hosts the Colón Theater, the international rated opera house. 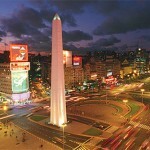 But, of course, Buenos Aires is more than this, that is why you need to try live as the citizens. This means you have to eat those giant but totally affordable steaks, drink mate, the local herby brew, taste the helado, the best ice cream ever after the one in Italy and explore the several barrios, including the trendy one, which is called Palermo and the gritty one, La Boca. Spend time visiting the art galleries and take one of the history tours to learn about the turbulent recent past the city has, in order to understand better the lifestyle and the culture.